Why pay for electricity when you can get free, clean energy from the sun? Roof Power Solar is a solar energy company based in Rich Hill, Missouri. 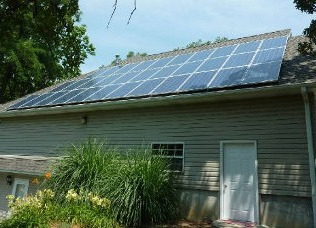 We design and install solar power systems for residential and commercial clients throughout the region. Our owner, Jeff Droz, has been living "off grid" since 2005 and has now assembled a talented crew of knowledgeable technicians to help others save money with solar power. We are dedicated to provide the best service and our goal is 100% satisfaction. Customers appreciate our excellent prices, speedy installations, and top-notch client care. The sun is an incredible source of free, green energy. With state-of-the-art solar panels, you can harness that energy to power your property and reduce your energy bills. With current rebates and tax incentives, now is the perfect time to make the switch to solar. At Roof Power Solar, we are passionate about saving you money. With a typical system, you'll pay up front for the equivalent of eight years of electricity and then get the next 25 years at no cost. We help you apply for utility approval and rebates to make the process as smooth and affordable as possible. A customer rebate is available for customers of Empire District Electric Company™. Contact Roof Power Solar in Rich Hill, MO, at (417) 395-2355 for state-of-the-art solar panels and affordable solar systems.